Edna K. Bickner, 528 2nd St., Oswego, Oregon. Oswego, Ore. 1908 or 1909. B Avenue looking east toward Willamette river. 1. W. F. & Edna & Ava Bickner home. 2. Henry W. Koehler home (1942) Burlingame. 3. Johnson Hotel. 4. Bickner Store. 5. John Bickner's home. OA#139. OHS Neg.#74523. Description Sepia photo. Same as 1526 & 1527 is a copy. [on postcard]: Oswego, Ore. Transcription Edna K. Bickner, 528 2nd St., Oswego, Oregon. 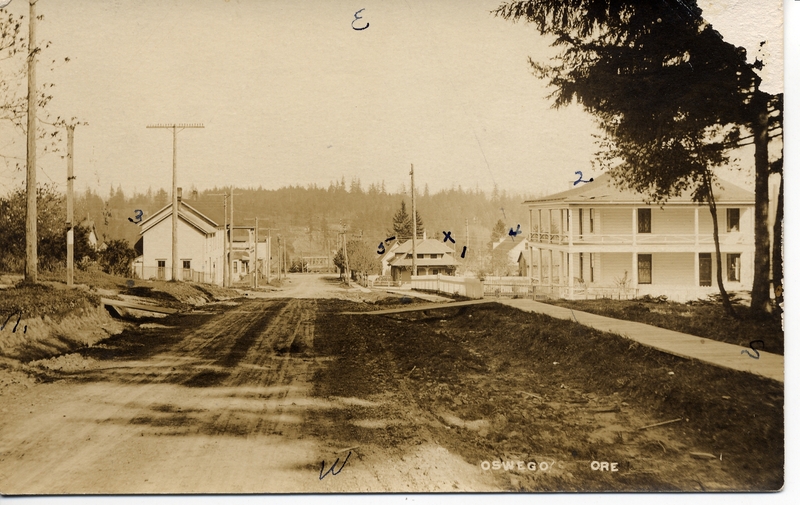 Oswego, Ore. 1908 or 1909. B Avenue looking east toward Willamette river. 1. W. F. & Edna & Ava Bickner home. 2. Henry W. Koehler home (1942) Burlingame. 3. Johnson Hotel. 4. Bickner Store. 5. John Bickner's home. OA#139. OHS Neg.#74523.